We’ve all been there! : recognizing the benefits of introducing STEM concepts to children at an early age but unsure of how to do so. Fortunately, early STEM learning does not require any advanced (or non-advanced) science or math degrees. It can be as straightforward as discussing the importance of formulating a hypothesis and then testing your presumptions; or, it can involve building structures made of everyday materials to test their strength (e.g., how many LEGO figures can a toothpick bridge hold). Although you can often construct learning projects from everyday household materials, this is not always convenient or feasible for teachers and/or parents. For that reason, many companies have developed STEM kits that provide one or more self-contained science, math, or engineering activities. The options range from traditional educational product companies, newly created subscription-based services, and toy companies (both familiar and newer, STEM-focused). In this post, I am going to provide an overview of STEM kits for 4-, 5-, and 6-year old children. This includes a list of household products that can be used to make your own! LEGO Mindstorms are one of the more recent robot kits designed for kids and another way for LEGO to support STEM learning. Mindstorms gives children (and adults!) the ability to create their own robotic machines, vehicles, inventions, and more. The basic Mindstorms kit–31313 MINDSTORMS EV3–comes with everything you need to get started, including instructions for building 17 different creations. Each creation can be controlled through a remote control found in the kit or a free app that can be downloaded to any tablet, PC, or MAC. Kits include bricks, stickers, programmable brick, sensors (color, IR, touch), infrared beacon, 3 motors, and more. And if Lego Mindstorms is a bit out of your price range, then consider checking out our review on Lego Boost. While it doesn’t offer quite as much as the Lego Mindstorms kit, it does pack quite a STEM learning punch. 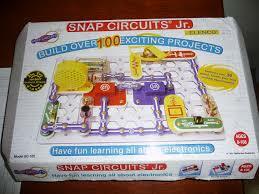 Snap Circuits are a favorite in my family. Each kit is self-contained, which means you just need one for your child to embark on many guided electronics adventures. Kindergartners will need a teacher or parent to guide them through building each circuit. For example, my daughter often gets tripped up when there are several layers to the circuit. Additionally, it is possible to cause damage to electronic components by hooking up particular pieces backwards. So, it is always a good idea to keep a watchful eye. That said, the beauty of a kit like this is that it easy for children to build and safe. If you’re an educator, then you are probably familiar with Lakeshore Learning. I have not personally used their products, but two things come to mind when I look at them: 1) high price and 2) quality components and educational approach. If you’re a parent purchasing a STEM kit for his/her child, then I might suggest trying to find something comparable on the regular market (e.g., basic STEM kits found on Amazon). Sign up for a subscription box; the subscription requires a monthly fee, cost depending on which company you order through. Grab your new STEM awesomeness from the mailbox or front porch. Open it and have fun! Alternatively, you can give it to your little ones and let them have fun. You can find STEM subscription boxes from several places. Steve Spangler is a familiar name around STEM learning. The Spangler Science Club targets children aged 5 to 12 years old. Because of that, many of the science experiments will require parental supervision and guidance. But depending on the plan you select, your child will receive instructions ranging from simple cards to detailed experiment guides. The Kiwi Crate from KiwiCo is designed for 5-8 year olds to be able to complete themselves. Each crate focuses on creative learning and offers children the opportunity for hands-on with engineering, science, and art. Additionally, each crate comes with a fun colorful magazine. The Tinker Crate from Kiwico is made for older children (9-16 years) than the Kiwi Crate. Each crate includes a blueprint that guides the learner on how to build their new STEM project. Projects include trebuchets, hydraulic claws, and fiber optic stars. I often find it convenient to have a pre-made STEM kit available for my daughter to use. However, sometimes being able to show your kid that science, math, and engineering happens all around you is helpful for teaching them basic concepts. Or, having a collection of common items can encourage them to experiment on their own. My wife and I bought our daughter a basic science kit and soon after completed the included experiments. What we found, though, was that she began “doing science” on her own. Of course, doing science for her is mixing water with dirt or anything else we give her. But it keeps her involved and interested in STEM. We’ve complemented this by encouraging her to build her own creations with LEGO and Goldiblox. Although there are not common household items, we find that they prompt her to invent her own creations and tell stories about what they do. You will probably find yourself also grabbing items from the kitchen, such as vinegar, baking soda, and food coloring.